AtariMax for 5200 has been around for a while and can load game via SD card. Works fine for me, as of right now. AFAICR, the old, back-in-the-day SNES copiers (using floppy disks and a couple of MB expensive RAM) had a bypass socket, into which you would plug a real cartridge. It passed through the connection to the security chip, so the real cart’s security chip opened up the console, while the copier provided the game data. This also worked for FX-chip etc games. You just need any old cart with the particular chip you need. Presumably the extra chip responds to it’s address range when it’s asked for. It only worked for the DSP-1 coprocessor. Others placed the ROM behind the coprocessor as a copy-protection mechanism. Using dual-ported VRAM is another option. The main differences are that the video data port is serial and the address bus must be shared. But since access is by whole rows of RAM, you don’t need to use the address bus so much..
Do they even make that any more? It’s a bit 1994-ish. Truly a piece of art. I have that monitor! Well… Mom does, I gave it to her since I have plenty of my own. She’s been using it for… dunno, over a decade possibly. The audio connector is getting a little questionable now. By the way, inputs are VGA, composite, and coax — it’s also a TV! There’s a 17″ version, too, the 710MP. A friend of mine has that one… dunno the res but almost certainly 1280×1024… most 17″ non-widescreen monitors are that. I had several monitors with resolution 1280×1024 with rectangular pixels, so 5:4 as well. It´s not bad. I even found a problem when I moved to widescreen monitor – I have to place the taskbar (or whatever you have in your system of choice) on the vertical edge of the screen, otherwise a significant portion of the display is not used usefully. MOS 6502C works with only 1.79MHz clock. Isn’t cheaper to simulate ROM chip with high end MCU? Modern Cortex-M MCU should be able to handle requests with such clock rate. I think he has it so that the game image is written to the dual-ported memory and to the console appears as a complete cartridge (as in the pi writes it once and is done, no further intervention). I like this idea as it means another mcu doesn’t have to act as a fifo and forever fetch data in response to address as a buffer. I assume that this would make the programming easier for the rpi? No, it wouldn’t. However MCU with 64-256 kilobytes of integrated SRAM costs from 5 to 10 times less than this ridiculously expensive dual port SRAM chip. As long as you don’t need to achieve tens of MHz clocks any modern MCU can simulate SRAM chip just with GPIO and EXTI. The way cartridge image loaded into this MCU may differ. 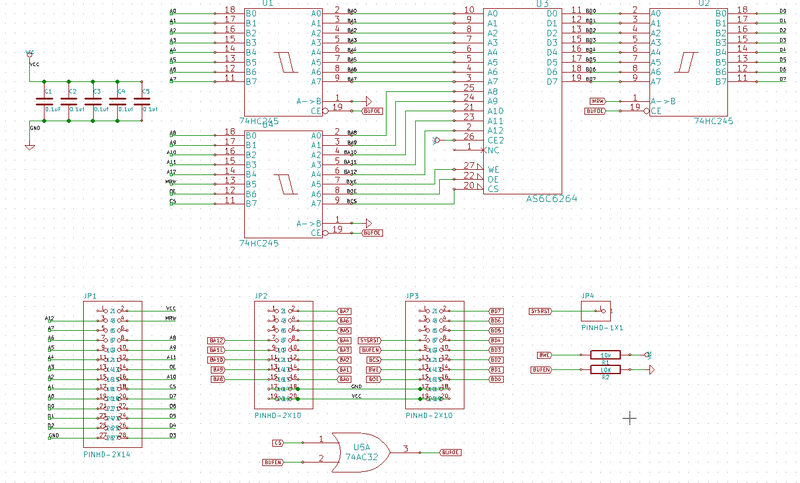 For example you can use SPI/I2C/UART or even something like ESP8266 (don’t try to combine two tasks to single core) to load image, so even schematics will be simpler than solution from this article. The Raspberry Pi’s standard Linux isn’t realtime, it can’t guarantee adequate response times to I/O events. And going through the whole OS to access the pins is likely to be much slower than doing it in machine code. Which you generally don’t do with a Pi, much of the hardware info isn’t available, and if you went for the bare metal you’d lose most of the advantages having a Linux board brings. A much simpler way would just to use single-port SRAM. There’s no need for both sides to access it at the same time. Maybe a bit of logic for the SRAM’s /CE line , and tristate the Pi’s bus once it’s done it’s job. The 5200 can surely cope with garbage on the data bus during setup, you’d just reset the thing once the game’s loaded in. So in all… a $5mcu, $2 level converter , $1 mems OSC, 1in oled $2, 4 buttons, $1 SD card card slot, $15 on the PCB $2 worth of passives and a programming header… that gets you to about $25 total give or take. If that is actually fast enough to work though is the real question… it should be. You could probably even implement bank switching. For a couple more quid, add a SRAM chip so at least you don’t have the hell of trying to emulate one in code. Using an MCU would be a pain in the arse to debug, with a SRAM everything’s modular and essentially doing the job the gods intended it to. You wouldn’t have to worry about instruction timing, writing stuff in asm, and whatever other stuff. You’d be able to start off with a simple working system, then add stuff a step at a time from there logically. The extra couple of quid could probably be absorbed in being able to use any old cheap MCU. If you do it Arduino, you have USB uploads built-in no bother, set it to an emulated serial port.